Zoe Thompson, originally from Memphis, TN, holds a Bachelors in International Relations focused in National Security and US Foreign Policy with a minor in Spanish from American University (AU) in Washington, DC. 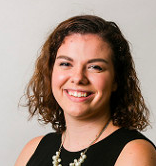 She was both Vice President and Secretary of her university’s SVA chapter, a Student Worker for AU’s military-affiliated community, as well as a member of Sigma Kappa sorority. She currently serves as the Chapter Support & Programs Coordinator at Student Veterans of America, and although she is without a military background herself, Zoe is committed to serving student veterans in easing their transition from service to higher education.